A mid-century inspired lino which, OK it maybe just squares, but this lino in these sort of colours was a very popular one in the 1950s and 60s. Again, it uses the almost standard kitchen colours of the time – black and white with red as an accent – and that may be why it was so popular. I have to say that another reason is that it looks nice and shows the room up well, a decision that I totally agree with! In fact the lino is made with a Filter Forge filter as before but using the British Standard colours of poppy red, charcoal and white as a base which gives this image a very authentic look, I felt and I was pleased with the result. This is a complex lino that echoes the first linoleums of the 1950s in both it’s motifs, style and colours. It has black and white, essential for the aspiring 1950s interior decorator in the UK, as well as simple rectangles to show to best advantage the size and depth of the room in which it is laid. Patterns and colours like this made it easy to match the lino to most colour schemes which in those days could look extremely bright to modern tastes which plenty of gold and yellow as well as highly saturated reds. However, it is shown here in my kitchen set which is deliberately made to look inoffensive and to blend with whatever floor covering I am showcasing. The pattern was created in Xara Designer using textures made in Filter Forge using, surprisingly, the Quick Wall Filter by DreamWarrior. 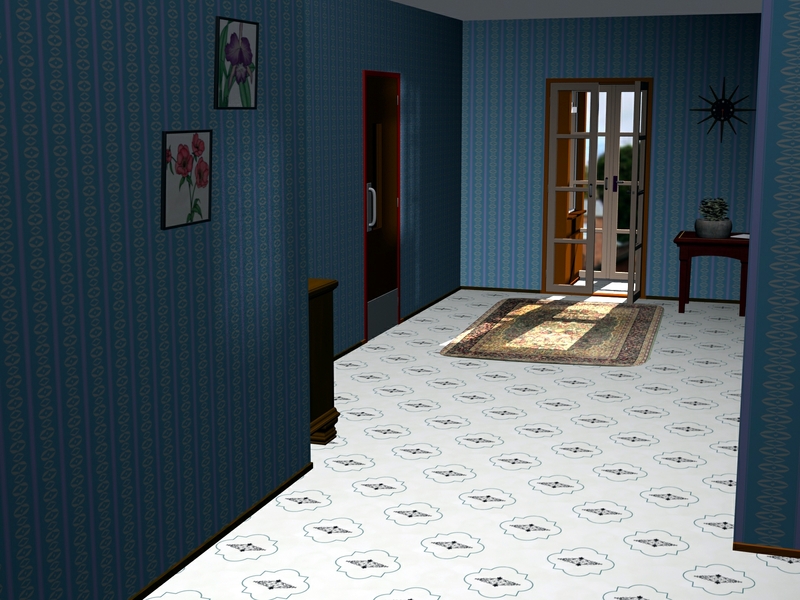 The final image was rendered in Cinema 4D using my normal kitchen set which was made in that program as well. A slightly more complex lino today which is based on early mid-century 1950s designs which have been brought a little up to date. 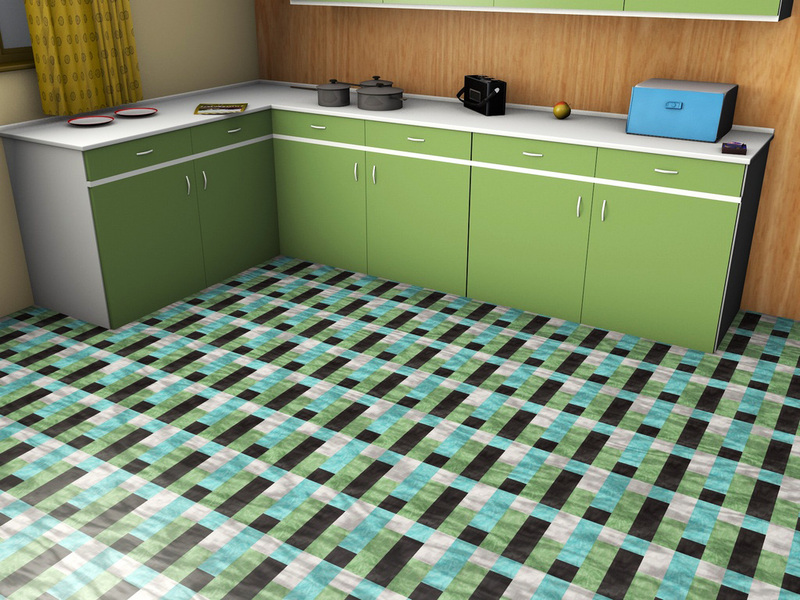 The design is a pattern of squares, as so much lino is, with a blend between the end colours of the small squares. The squares process diagonally which gives shape and size to the room as you can see in the half-finished kitchen, making it look quite big. 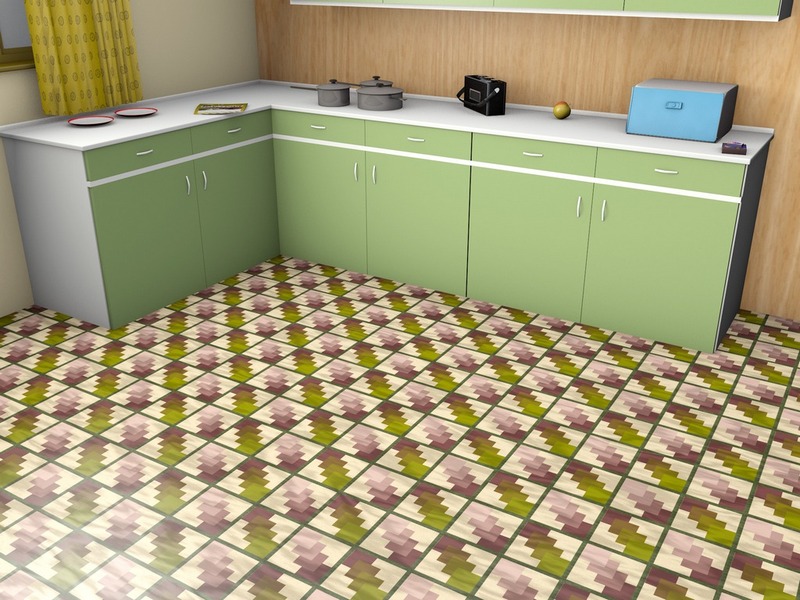 The pattern was made in Xara Designer and the image produced in Cinema 4D using my normal kitchen set. Another excellent and extremely practical lino today which owes much of its inspiration to mid-century linoleum patterns. The design is a very simple pattern of squares, a motif which goes so well in rectangular rooms to emphasise both the width and the depth. The lino does not have a ‘way’ and could be used in any direction which, again, emphasises the size of the room. 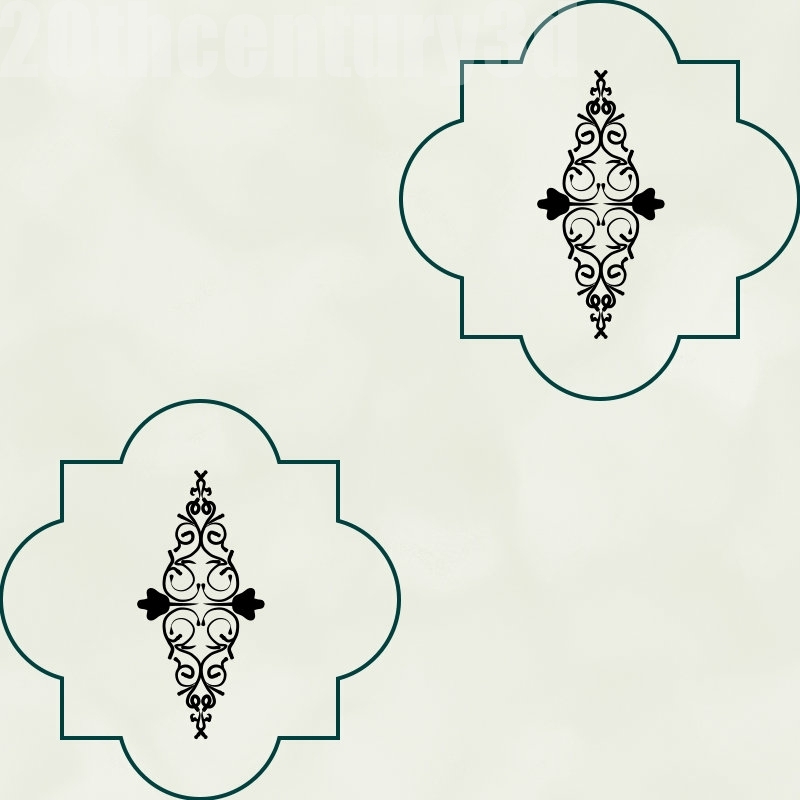 I have shown just one example and one colour although this motif was used over and over again in many different forms to produce linoleum for domestic and also for commercial use where it was used in hotels and (on a smaller scale) offices. 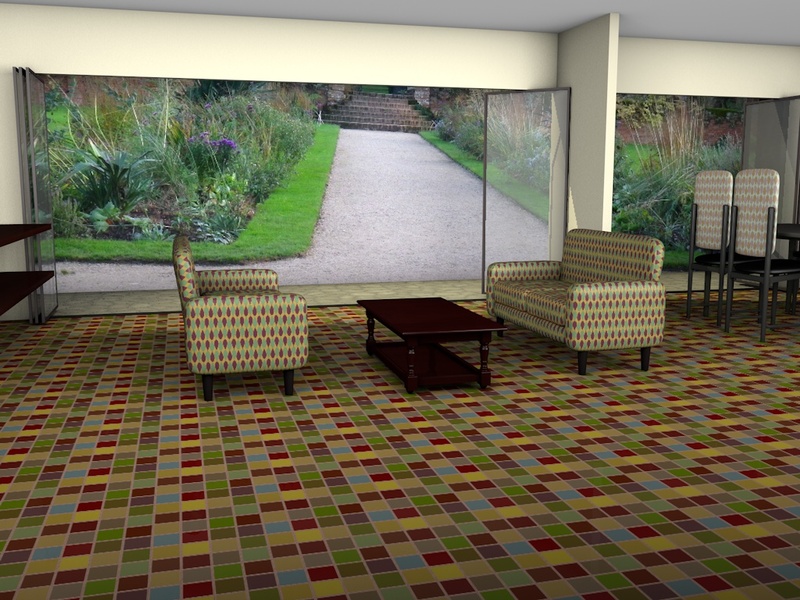 I produce these 3-D models in order to show what the pattern looks used in a typical setting. I feel that this is much more useful than simply showing a swatch of the pattern which gives no idea of the scale at which it is used or the type of product for which it is intended. For this reason I produce the 3-D models quite quickly although I do take time to make them as realistic as I can and I have spent time trying to make this particular image look better than those that preceded it. 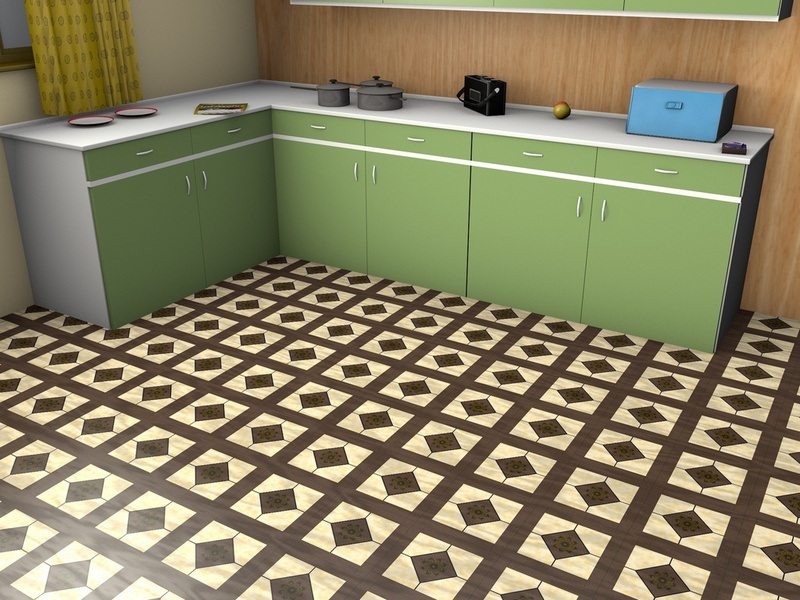 This is a mid-century inspired lino which is shown in what could be my new kitchen still in the course of construction. 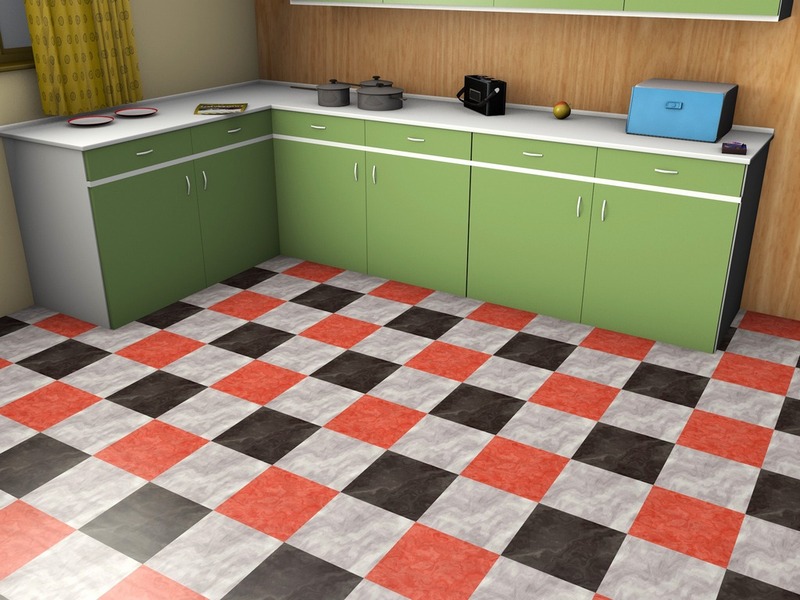 Linoleum or oilcloth as it was also called was a staple floor covering in mid-century times and still exists to this day. It is durable, easy to clean and can be had in a variety of colours and patterns. After the dreary and somewhat dingy rooms of the 1940s it was a pleasure for new house owners in the 1950s and 60s to decorate their rooms in bright and cheerful colours. The sitting rooms in the house tended to be restrained but the kitchen was an area that could be filled with colour as, to a certain extent, was the bathroom which also received treatment with lino. 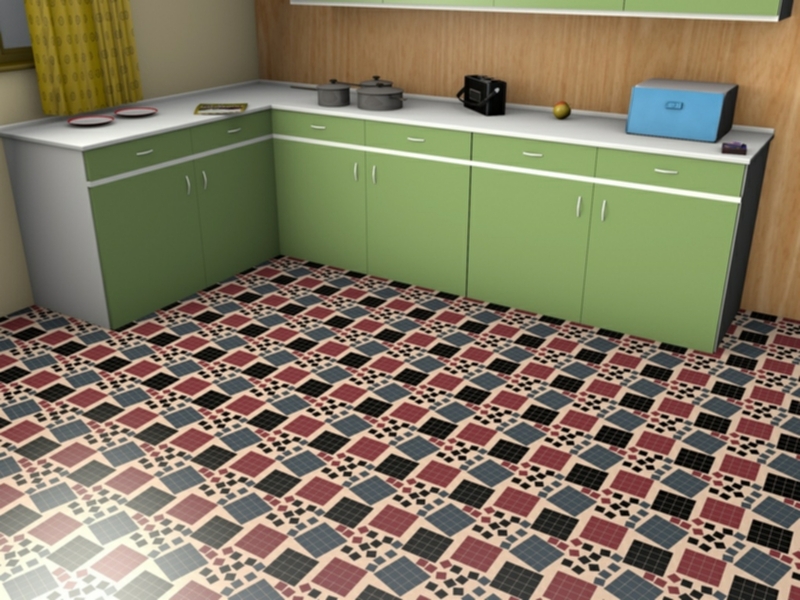 This partially constructed kitchen with just its units, awaiting the cooker, is a perfect place to show the new floor covering and I hope over the next few months to show other mid-century inspired linoleum patterns. The set was constructed in Cinema 4D and the pattern created in Adobe Illustrator. For those interested, the colours in the pattern are mid-century ones from the British Standard range of colours: crimson (or cherry), black and blue grey while the background is lovely cygnet.